The CopperStopper All Stainless Steel Line Stop Saddle series are available as a bolt-on solution for use with the highly rated Qualitech Line Stop machines. 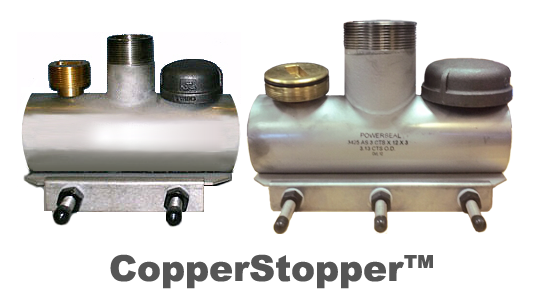 This Line Stop Saddle is manufactured for an exact fit on Copper Pipe. It comes with a NBR Waffle Gasket, All Stainless Steel Construction with Brass Completion Plug and MI Cap. They are rated for water and sewer applications up to 150 psi. 5x12x5 and 6x12x5 units ship 2-3 weeks ARO - Call first for availability.